Church Planting 2: The Pastor – What Makes a Good Church Planter? There is more to come, so don’t forget to subscribe to StartUp here. Unlike StartUp, I have not been listening to This American Life from the beginning. I have been listening for a number of years. The storytelling is world-class. I have appreciated many episodes over the years, though the one that brings them to this post includes a segment about Restoration Church and brings in a bit different angle. You can take a listen at If You Build It, Will They Come? I have been an on and off again listener to Hidden Brain – usually depending on the opportunities and challenges of a particular season of life. This episode, Creating God, takes a look at how religions have evolved, almost like living organisms, to help human societies survive and flourish. This approach to religion is from a social psychologist and it is fascinating, challenging, and hopeful. You can take a listen at Creating God. After you listened, what was your response? What podcasts do you listen to on a regular basis? Over the past few days, I have continued in prayer for Charleston. I want to share a portion of my response to the Charleston Church Shootings which I preached this morning at First United Methodist Church. I believe it is important and inadequate. You can find the entire sermon and manuscript online here. God never intends us to choose evil. The Charleston Church Shootings were not part of God’s plan. Racism, murder and tragedy will never be God’s will. Evil is never, ever God’s plan. Each one of us has choices to make every day. We choose between good and evil. We choose between forgiveness and resentment. We choose between light and darkness. The choices that we make – both big and small lead us closer to God or further away from God. Choose to follow Jesus Christ, Emmanuel – God is with us. I am preaching this Sunday at Resurrection West. I am looking forward to the opportunity to share good news with the congregation. I am particularly looking forward to it as I did not have the opportunity to preach while serving as Pastor of Resurrection Online. We are in the middle of a series in which we are reflecting on the events of September 11, 2011 through the lens of the Christian faith. I am preaching on Living Without Fear in an Age of Terror and will be using verses from Psalm 27 and Mark 5. If you are interested, you can follow my progress in the days ahead at the Google Doc – http://j.mp/pTdEht It is pretty rough right now and won’t be in a finished form until some time Saturday night. If you take a look at it, will you please share your thoughts feelings or opinions? I would love to hear from you. “Return to your fortress, you prisoners of hope; even now I announce that I will restore twice as much to you” (Zechariah 9:12, NIV). Of all the things that I could be prisoner to, I hope that I will always be a prisoner of hope. This week, I read Why? 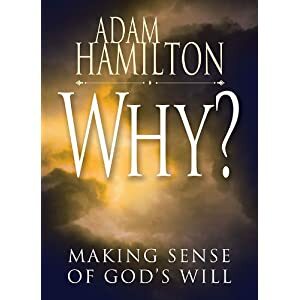 : Making Sense of God’s Will by Adam Hamilton. In this short book, Hamilton addresses three questions of theodicy, God’s justice in the face of suffering, Why do the innocent suffer? Why do my prayers go unanswered? Why can’t I see God’s will for my life? He concludes with a few words about Why God’s love prevails. As a pastor, I have spent time studying the history of Christian thought around these questions as well as spending time with people who are asking some of these very same questions. In this book, I found both a few new approaches to responding to these questions and encouragement for my own why questions. I appreciated the clear illustrations, biblical examples and easy to follow structure. While this book will be helpful for anyone who is struggling with why questions about their faith, I most strongly recommend it for leaders of Christian communities who will interact with people who are trying to make sense of God’s presence and action in their life at difficult times. In addition, I believe that you will find, as I did, that the words of this book provided helpful guidance for my life in ways that I was not expecting. I know that I will refer back to this book again in the future for both personal and professional use. This is the first year that we will intentionally collect annual giving commitments from those who worship with Resurrection Online. I am excited to offer this opportunity to grow in faith for those that worship online. This also will help us plan for ministry in the year ahead. If you would like to help support Resurrection Online, please visit http://www.rezonline.org/giving. I created a series of videos to share more about this possibility. It seems that this question has most to do with how one interprets the Bible. Scripture is inspired by God and paints a picture of God’s character, God’s action and God’s people. “All Scripture is God-breathed and is useful for teaching, rebuking, correcting and training in righteousness, so that all God’s people may be thoroughly equipped for every good work” 2 Timothy 3:16-17, TNIV. Scripture is the written Word of God that reveals the personal Word of God, Jesus Christ. The good news and truth of scripture can be a source of faith. As such, scripture becomes authoritative and normative for the Christian life. So what does this mean when it comes to Jesus’ miracles? I believe that Jesus miracles are true and historical fact. They point to the reality that Jesus is God in the flesh and that He has control over all creation. However, my faith does not rest on the historicity of Jesus’ miracles.